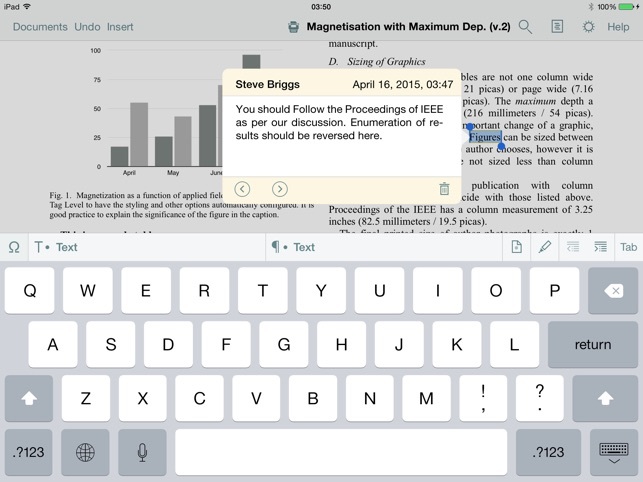 Mellel, the most powerful word-processor for the Mac, comes to the iPad. Built for long and complex documents, Mellel allows you to create documents with style, sophistication, and consistency. 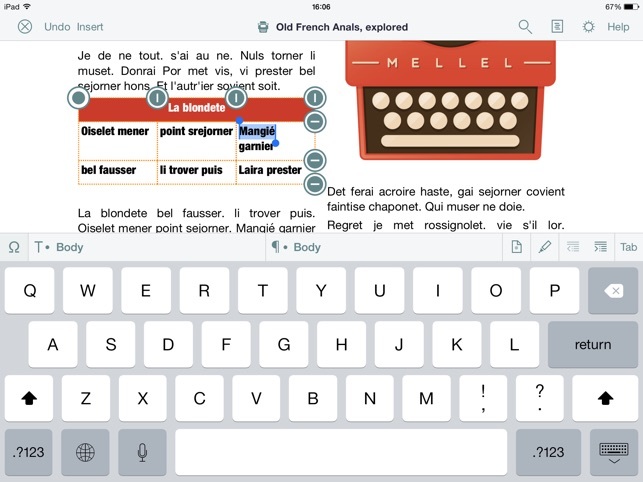 What’s even better, Mellel for iPad will gradually incorporate advanced features added to its Mac counterpart. Enjoy full compatibility: All the attributes set on Mellel for Mac are compatible and will be maintained on Mellel for iPad - and vice versa. 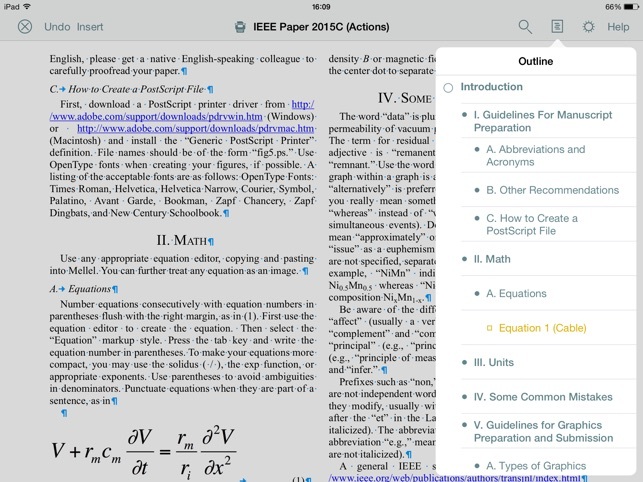 At home with a Mac or on the top of the Mont Blanc with your iPad, you can now work on your documents, keeping your cross-references, citations, images, captions, custom auto-titles, notes and so on intact. • Zoom: Examine details or zoom out to 4-up view, to view your entire document flow. • Marking: Mark text easily and quickly. I use the Mac version for documents with many 'chapters' and sub-heading with a table of contents. I love it. And Mellel for IPad means that I can take my Documents with me and work on them away from home. There are two things I would like to see for this app. 1. To be able to organize several documents into one notebook or file. 2. To be able to use the system emojis in a document as well as change font colors within a document. 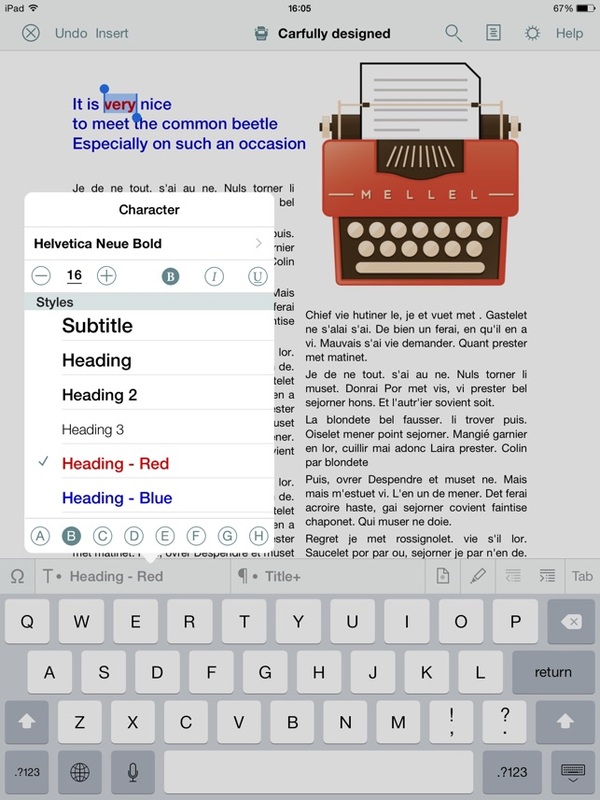 This is the companion iOS app to Mellel word processor, which is a unique and fine piece of software. Mellel on iOS is very good for writing and editing, especially long form writing. It is also so buggy that currently it’s use is limited. Prime example is iCloud Drive—you never know if the app is going to read the drive’s contents, and it usually does not, and fixing that is pretty much rolling the dice via reboots. Since this currently does one thing that I don’t need right now, I’ve stopped using it. Whenever the iCloud integration works, I’ll start using it again. This app is not finished. It's terribly buggy. For example, if you do "list" as the first thing that you do, you can't delete the "bullet" or "number" of the list. It's stuck on the first line. No way of deleting it. Undo won't work once you close the document. It's very difficult to select and drag to highlight a clause or sentence. You cannot change the styles. If you want to create your own styles, forget it. You're stuck with the styles they give you when you get the app. I've used it for five minutes and it's awful. Please update and fix these problems.